BURBANK, CA and Irvine, CA. July 16, 2015 – R.D. 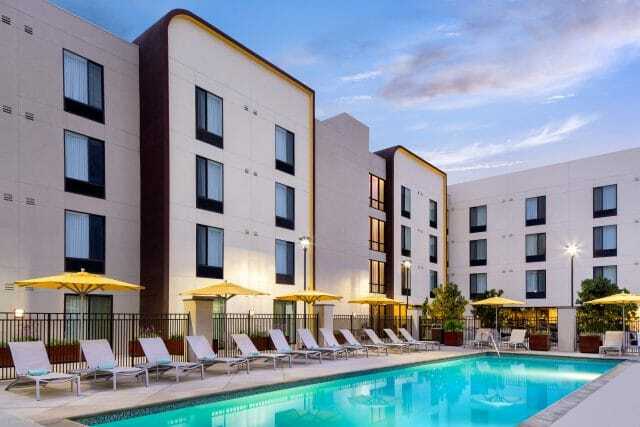 Olson Development has opened the 170-room SpringHill Suites by Marriot hotel in Burbank, California, adding to the growing list of completed projects for the Irvine, California-based developer. Executives from R.D. Olson Development and Marriott International were joined by City of Burbank civic leaders at the ribbon-cutting ceremony today for the new hotel, a project that marks the continued revitalization of downtown Burbank. This project marks R.D. Olson Development’s second Marriott brand development in Burbank. The firm also developed the 166-room Residence Inn by Marriott Burbank, and drew upon its experience in the Burbank market for this project. “We saw this as an outstanding opportunity to energize this street-to-street block on San Fernando Boulevard and make a significant contribution to the growing economic base in Burbank,” said Bob Olson, president and CEO of R.D. Olson Development. SpringHill Suites by Marriott Burbank is located on the south side of San Fernando Boulevard between Providencia and Santa Anita Avenues. The location is close to Burbank Town Center and is a two-block walk to downtown Burbank. 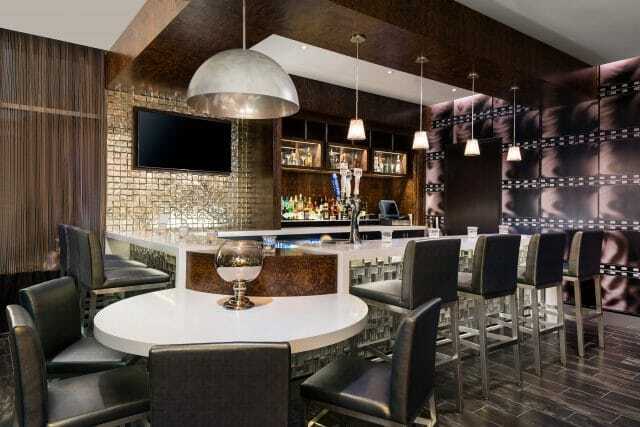 The all-suite hotel features Marriott’s latest Gen 4.5 design for SpringHill Suites and meets the needs of both weekday business travelers and weekend leisure guests in a contemporary setting. The 102,075-square-foot hotel is designed with a room mix that includes 88 king bed and 82 double queen bed configurations. Guestroom suites offer dedicated work spaces with full-sized desks, free high-speed Wi-Fi, separate seating areas, kitchenettes with microwaves, mini-fridges and coffee service, and bathrooms equipped with separate showers and bathtubs. Public amenities in the hotel include a breakfast area, lounge, meeting facilities, state-of-the-art fitness center, business center, guest laundry and an onsite convenience market. Outdoor amenities include a beautifully landscaped outdoor space with a fire pit and an inviting pool and spa area. The SpringHill Suites Burbank features an interior design theme that pays tribute to the local area, as is customary for R.D. Olson Development hotels. In this case, the sleek interior setting pays homage to the entertainment and media industries that have shaped Burbank. The bar area honors classic Hollywood icons, and is complete with a mural of Marilyn Monroe. It is aptly named NINETEEN26, and will attract hotel guests, as well as the general public. R.D. Olson Construction served as the general contractor on the project. In addition to this property, R.D. Olson Construction and R.D. Olson Development are partnering on several upcoming projects including the 144-room Residence Inn by Marriott in Old Town Pasadena, California, the 200-room Residence Inn by Marriott in Wailea, Maui, Hawaii, the 130-room boutique Lido House Hotel in Newport Beach, California, and the 250-room, beach-inspired Paséa Hotel & Spa in Huntington Beach, California, situated across from the famous Huntington Beach Pier. R.D. Olson Development has been actively developing hotel properties over the last four years, having completed over 1,000 rooms in California and Hawaii since 2011. The developer also has more than 1,600 rooms in its development pipeline, including the recently announced 250-room Marriott at Irvine Spectrum, the second of its kind for the latest generation flagship hotel by Marriott. “R.D. Olson Development is built on the principles of providing what the marketplace demands, maintaining clear focus on the end user, and delivering creative solutions and profitable ventures and developments,” said Jonathon Vopinek, vice president of asset management for R.D. Olson Development. About R.D. Olson Development: Based in Irvine, California, R.D. Olson Development creates value by developing and repositioning commercial properties nationwide. A specialist in developing hospitality properties, the firm also develops office, retail, multi-family and recreational projects. R.D. Olson Development is recognized for its ability to identify and act on opportunities, delivering solid execution through all phases of design and development while maintaining focus on the business strategy and the bottom line. Robert Olson founded R.D. Olson Development in 1997 following nearly 20 years as founder and CEO of R.D. Olson Construction. The firm’s portfolio of developments may be viewed at www.rdodevelopment.com.